Goodwill is a national non-profit organization, that accepts clothing donations for resale, whose profits fund community programs & job training for people in disadvantaged circumstances. Goal: Identify opportunities for service innovation at Goodwill NYNJ. Shopping - There is a consistent variety of high quality clothing at affordable, flat prices. Community impact - Profits are used to help disadvantaged people in the community with work placement and training. However, when we researched the current situation of what is happening to used clothing in the city, there is a visible disconnect. Why are people not using this service and how can we improve that? In order to get an extensive understanding of the current market and user behavior we interviewed people across four different categories. Employees of Goodwill, current customers of Goodwill, current customers at competing stores in nearby locations in the city and a targeted selection of the general public who did not use these services at all. Overall we found some interesting insights about potential donaters and customers for Goodwill. They were familiar with Goodwill while growing up but don’t think about it as an option in New York. People don’t think of Goodwill as somewhere that stocks high quality clothing. They are interested in making a positive impact by donating. Convenience & time are the main barriers. How can we make Goodwill top-of-mind for people who want to make a positive impact? Our target demographic now make the majority of their purchases online, which satiates their need for convenience. How can we tap into this behavior to make clothing donation part of their usual routine? Good Returns is an initiative where we would partner with online clothing stores to provide shoppers with a return shipping label that goes directly to Goodwill donation centers. 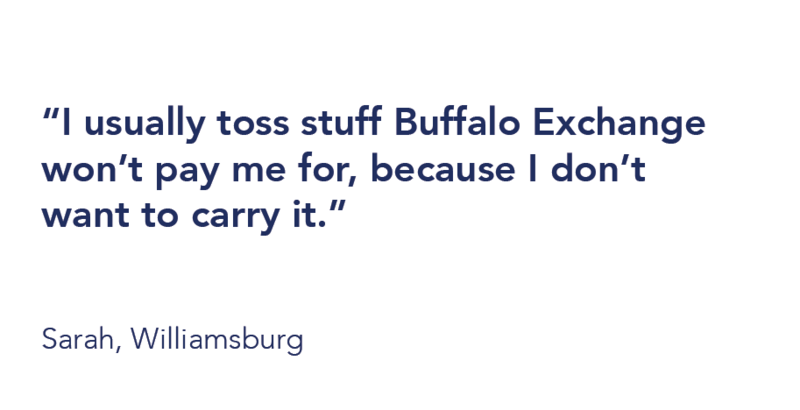 Customers who are not returning their newly purchased goods can use the shipping bag to easily donate clothing, and clear up some space in their closet for their new item. Our target demographic are interested in making a positive impact by donating but again, convenience and time are the main barriers. 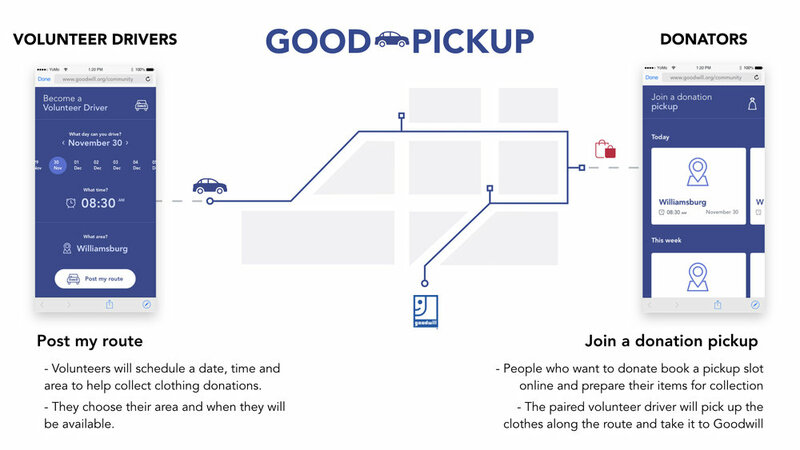 Good Pickup allow users with some free time on their hands the opportunity to help collect donations in their area to drop off at a nearby Goodwill donation centre. People with clothing donations can easily book a time slot that suits them for pick up and allows them to get rid of clothing without the guilt of throwing it out or leaving it sitting under their bed for another season.